Fall in Austin means one thing to football lovers – Longhorns tailgating. 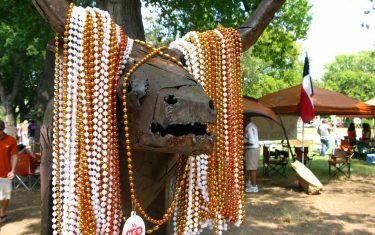 Get ready for grilled burgers from the bed of a truck, a sea of orange and white, and shouts of “Hook ‘em horns!” Tailgating is a huge part of the home-game experience for Austinites. If you’re planning on throwing your own party this season, follow these tips to be the host with the most! Make sure you have a spot lined up for your tailgating party – otherwise, the whole event will start off on the wrong foot. Tailgating goes down on the east side of I-35 and south of Darrell K. Royal-Texas Memorial Stadium. However, securing a spot can be very difficult unless you are a donor to the Longhorn Foundation. You can also try local Craigslist listings, as some people sell their spots if they can’t make it. You don’t necessarily have to tailgate right where the action is happening – try parking lots nearby and take a cab or shuttle to the actual game. Food is one of the best parts of tailgating. Come prepared with the most delicious Austin tailgating meals on the market – namely, barbecue. Bring a mini grill and supplies if you want to cook during the party. Just make sure the area where you’re parking allows your type of grill. Keep a cooler with lots of ice handy to make sure none of your perishables go bad. Keep your meat, cheese, and any salads with mayonnaise (egg salad, potato salad, macaroni salad) cold. Consider hosting a potluck-style tailgate party, where your guests help out by bringing side dishes while you cook the main course. Don’t arrive prior to your permitted arrival time. Alcohol is allowed, as long as you drink within the confines of the law. Grilling is permitted, but do not leave fires or coals unattended. Do not use your grill inside a parking garage or on the sidewalk. Pets must be controlled with leashes and supervised at all times. Keep your area clean, and don’t leave a mess behind. Make sure your guests conduct themselves properly. Check the University of Texas parking rules for the most up-to-date version of what not to do while tailgating. University police have the right to terminate any tailgate party for inappropriate behavior. Mother and dawghter Labor Day picnicking. ❤️#jade #laborday #dogdaysofsummer #centralpark #hookem ???? photo cred: @handsome_ray ?? Above all, a tailgating party should be fun. Wear UT’s colors, plan some tailgating games, and make sure your guests have a good time. Make sure to accommodate any special needs or requests of your guests, such as food allergies or guests who do not drink alcohol. Children are more than welcome at tailgating parties, as long as adults supervise them at all times. Now you’re ready to host your tailgate. Grab a beer, let loose, and toast to the Longhorns! This post is an editorial contribution from 21st Century Painting, Austin’s leading interior and exterior painters.